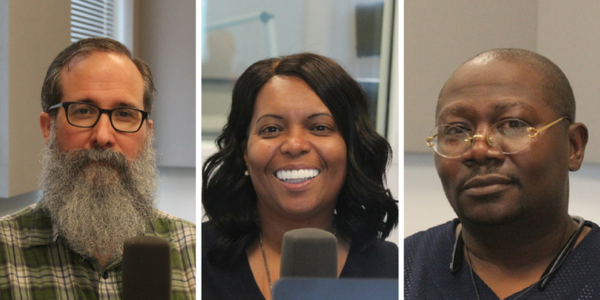 Matt Sorrell, Lavinia McCoy and Sean Morris discussed soul food on St. Louis on the Air. For the uninitiated, you may only know the fried varieties of soul food, but as Sauce Magazine’s Staff Writer Matt Sorrell puts it, there’s way more to the story. He wrote extensively about the subject in Sauce Magazine’s most recent issue. Sorrell said soul food is considered a “subgenre” of southern food or comfort food. “It is an African-American tradition that was produced by slaves who took their traditions from Africa and dealt with ingredients they had to in America,” Sorrell said. Joining the program to discuss the history of soul food and its incarnation today were two restaurant purveyors: Lavinia McCoy, of Gourmet Soul, and Sean Morris, of Mother’s Fish. Their two restaurants provide different takes on the genre. Shrimp ‘n grits, chitterlings and collard greens are three dishes you can find in most restaurants. Morris said his favorite dish served at his restaurant is the catfish filet. McCoy said shrimp ‘n grits is her favorite. St. Louis on the Air contributor Steve Potter discusses the history and present of soul food in St. Louis with the two local restaurateurs behind Mother's Fish and Gourmet Soul.